The anniversary of the date when your pastor first joined your church staff is an important time of year. So use appropriate pastor anniversary themes ideas to celebrate the special time to show your appreciation and love for pastor is perfect and meaningful. Whether you choose to organize pastor anniversary party, plan an anniversary speech, host a banquet, or even a week of entire service, I am believe any number of imaginative themes can help make the celebration truly memorable. This article would like to share some appropriate pastor anniversary themes with you and help you or a church honor the past, evaluate the present, and plan for the future. 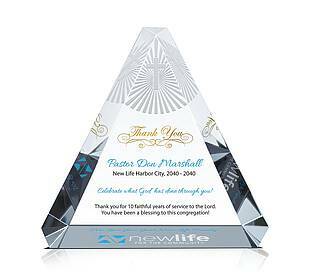 So a Thank You theme will focus pastor anniversary festivities on showing appreciation for all the pastor has done. Plan a “Thank You” dinner, party or other program in honor of the pastor and his family. During the feast, invite members of the congregation to give a speech highlighting how their lives and soul have been improved through the pastor’s years of service. 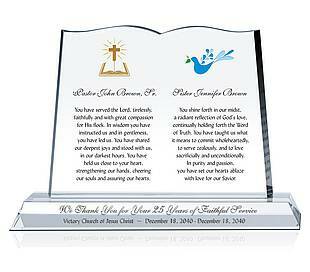 Honor your pastor by customizing a personalized pastor award/plaque with engraved appreciation quotes/poems. It will be the highlight of the “Thank You” theme. Our pastors point us to God, pray with us about our needs, counsel us through our life’s challenges and fears, and consistently deliver sermons to uplift our souls. A “Pray for Pastor” theme lets people know the meaning of prayer that is a direct line of communication to God. Pray for your pastor’s health, happiness and spiritual growth. It is perfect to use a “Sheep and Shepherd” theme to celebrate a pastor anniversary. The bible says God appoints pastors to be shepherds over the people, or sheep of the church. You know the word we use today for pastor is a translation for the word shepherd, a word which means a person who guards, tends, feeds a group of sheep, and protects, guides and watches over a person or a group of people. This theme helps people remember and honor their pastor’s previous ministry. It is an appropriate opportunity to review what God did in your church during the past year. Take the time to make your pastor and his wife feel they have done a worthwhile job. Write a sincere appreciation letter to bring your best wishes for them. A “Looking Forward” theme allows people to honor and remember the duties that the pastor performed in the past year. But while we keep an eye on the past, we are looking forward to the future. Investigate the needs of pastor, and pay more attention to something that your church hopes to accomplish in the future.